See Martini’s, 6th, pp 320-327, Eroschenko’s 9th , pp 75-83. Muscle is a contractile tissue which generates tension through the molecular pull exerted on actin by myosin fibers in the sarcomere (review these terms in your text). 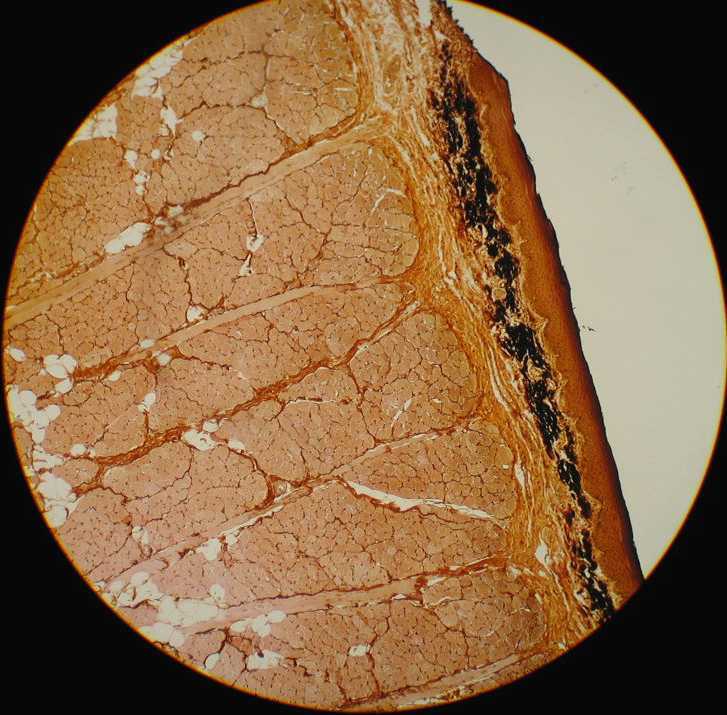 There are three histological classes of muscle, each of which functions in a unique way. Evidence of repeating sarcomere units can be seen in the cross striations of striated and cardiac muscle. The dark “A bands” are arrays of myosin. The light “I bands” are the spaces in between where there is no myosin. 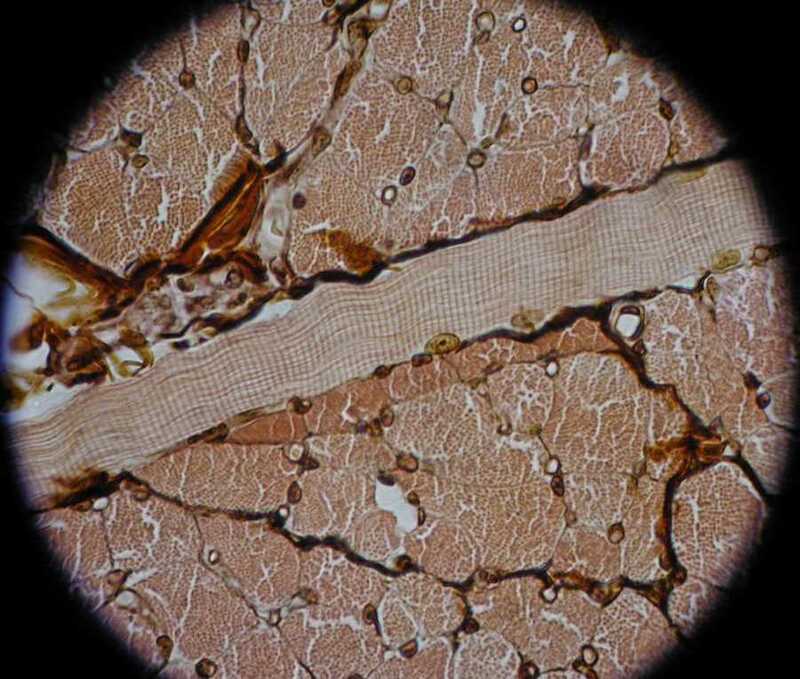 Look closely at a longitudinal section of skeletal muscle to see these bands. I. Smooth muscle cells are tapered at the ends and possess a single centrally located nucleus. Their sarcomeres are not arranged in an orderly repeating fashion, and therefore the cells lack visible striations. These cells are slow contracting, and are responsible for involuntary visceral contractions (peristalsis, uterine contractions, bladder contraction, “bristling” of skin hairs, vasoconstriction, etc). II. Striated muscle consists of multinucleated fibers produced by the fusion of many individual cells to form a muscle “fiber”. The nuclei and mitochondria are pushed to the outside of the fiber. It owes its striations to regular, repeated arrangement of sarcomeres. It is voluntary, rapid acting, and relatively easily fatigued. It is also known as skeletal muscle, and is responsible for movement of bones. III. 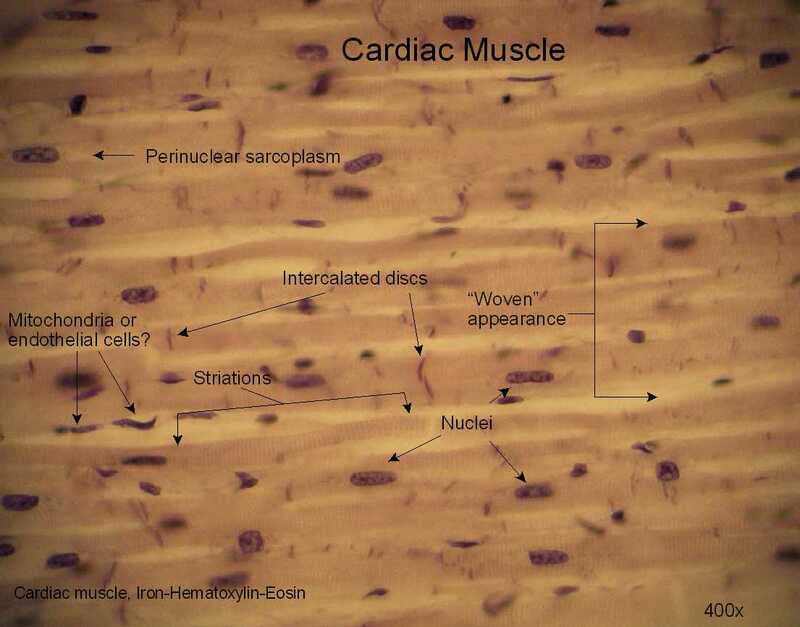 Cardiac muscle, also termed “striated involuntary muscle,” is found only in the heart. Its cells usually contain a single centrally located nucleus, display striations as in striated muscle, but, due to branching interconnections, appear woven together under the microscope. 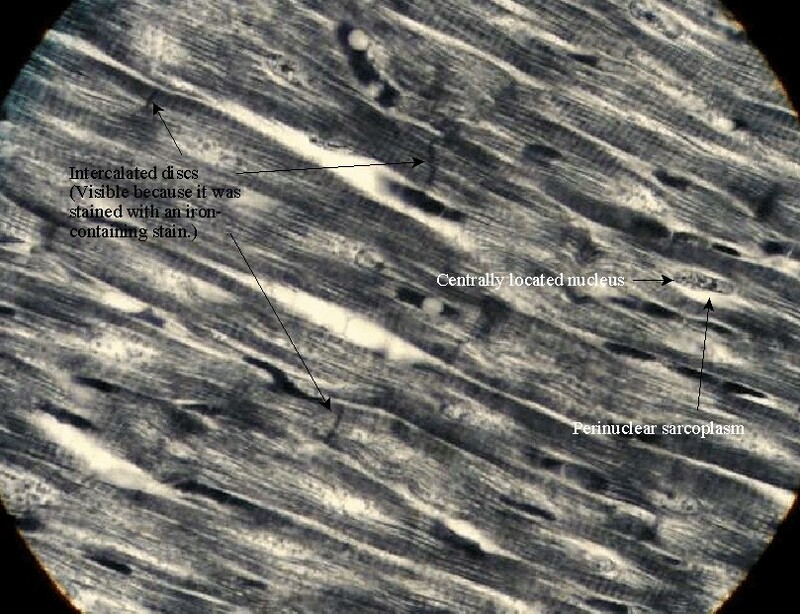 In contrast to striated muscle fibers, their nuclei are centrally located in the fibers. 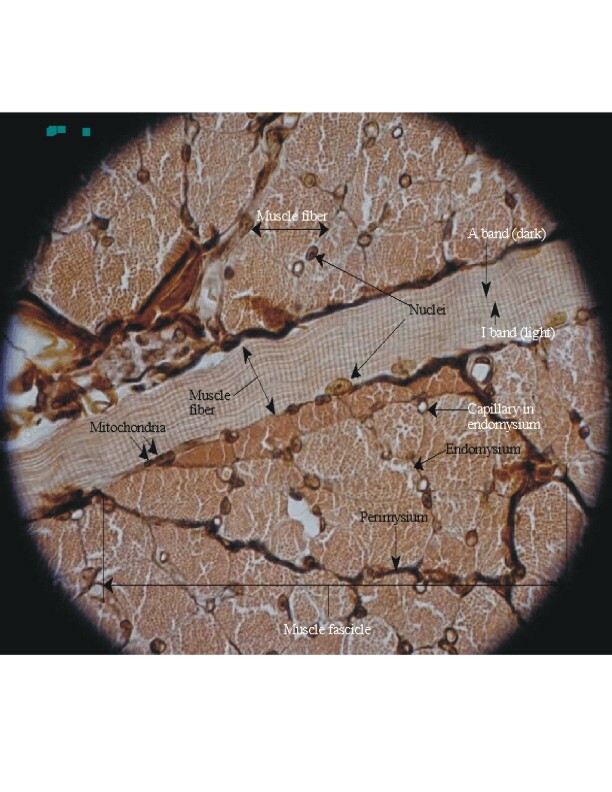 The interconnections between fibers, intercalations, are diagnostic of cardiac muscle but visible only when stained with with iron-containing stains. It is capable of intrinsically initiated rhythmic contraction. (Draw three or four of these teased out individual smooth muscle cells. These are hard to see, so carefully follow microscope protocol (focus first on the edge of the cover slip). This specimen is from the tongue which is particularly good to show traits of skeletal muscle because it has fibers running at right angles to each other, allowing a longitudinal as well as a cross sections in a single view. Here is a labeled 450x view of skeletal muscle . muscle fascicle bundle of muscle fibers: include them in both c. s. and l. s.
muscle fiber formed from fused muscle cells, show in both c. s. and l. s.
Two slides are shown. The two images are from cardiac muscle stained with hematoxylin-eosin. It shows centrally located nucleii, but not intercalated discs, one of the diagnostic features for cardiac muscle. Here is a labeled image of cardiac muscle stained with H&E . The bottom image is cardiac muscle which has been stained with an iron-containing stain which makes the intercalated discs stand out. Here is a labeled image of cardiac muscle stained with Iron H&E (shows intercalated discs). 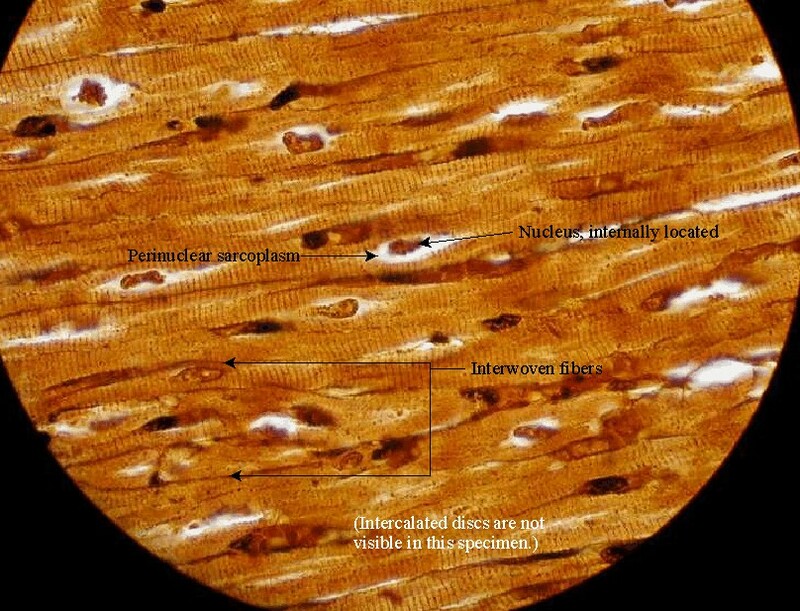 Here is another labeled image of cardiac muscle stained with Iron H&E (showing intercalated discs) .